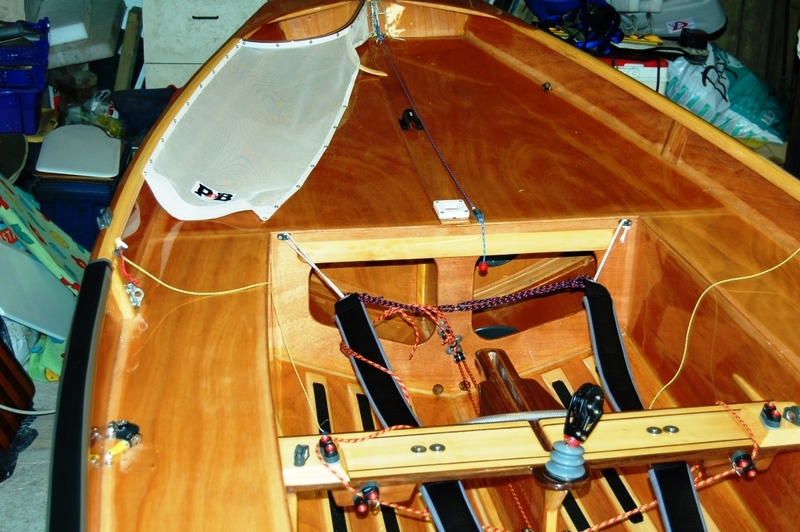 In the early days, the 'standard' wooden Mirror dinghy was equipped with wooden jib fairleads fixed to the inner gunwale, about 305mm aft of the aft shroud block, as in the photo above. 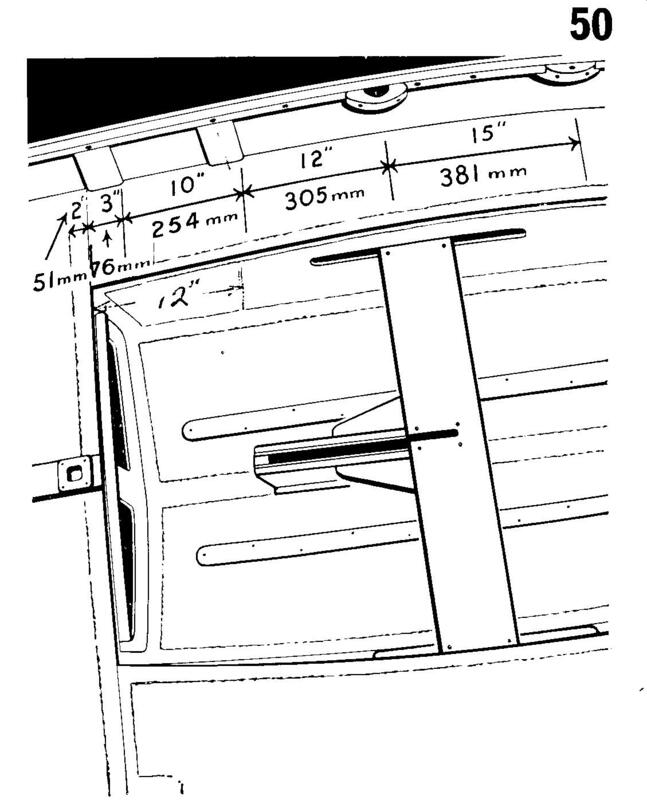 Attached with two counter-sunk 11/2 " X 8 (gauge) screws from the inside according to page 18 of the Bell Woodworking building instructions. 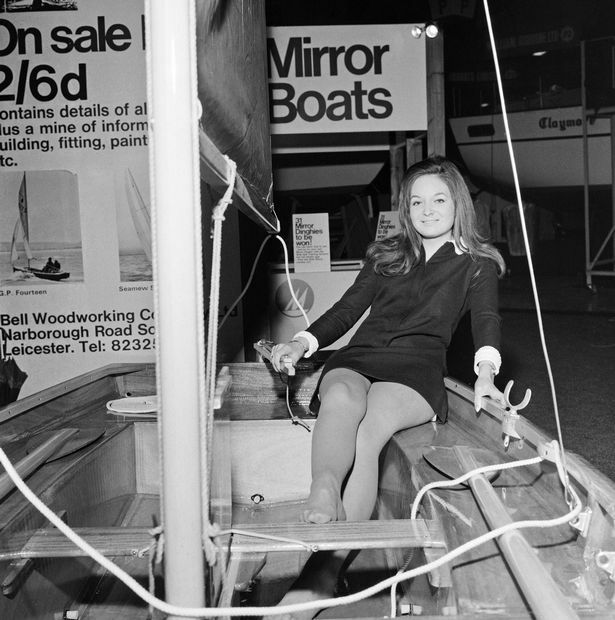 This low cost solution was one of the measures taken to keep the cost of boats down (between 1963 and the 1980s). It's hard to believe these were cheaper than bullseyes (which were used on the mainsheet), but they formed a handy mounting platform for better fittings if you decided to upgrade. There were no jib sheet cleats. 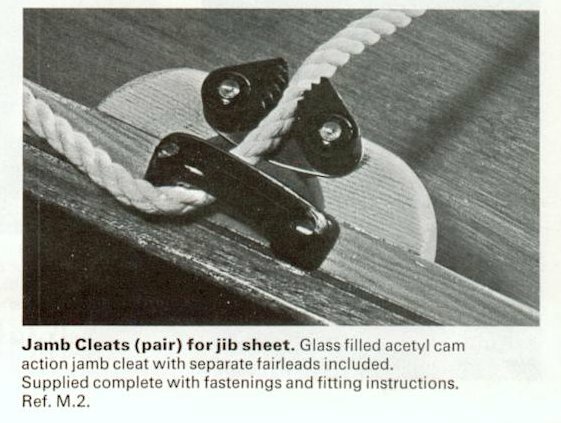 A common upgrade was to fit a pair of jib fairleads and cam cleats, either combined, on as seperate fittings, which were just screwed onto the inner guwale and the old wooden jib fairlead. Over the years, as Mirror sailors have sought better performance, the position of the jib fairleads has moved inboard from the gunwale, onto the side deck (as per this Hyde Sails tuning sheet from 1990), and in some countries, to the thwart. At the same time, sailmakers have been subtlety changing the shape of the jib, by making the luff shorter than the maximum permitted, which drops the clew of the sail closer to gunwale level and moves the correct sheeting position further forward. As ever, the sailmakers tuning guide for your sails will tell you where the sailmaker thinks the jib fairleads should go. If you can't find the right guide for your sails, one from another sailmaker, but for the same era as the sails, should give you a starting point from which you can start experimenting. 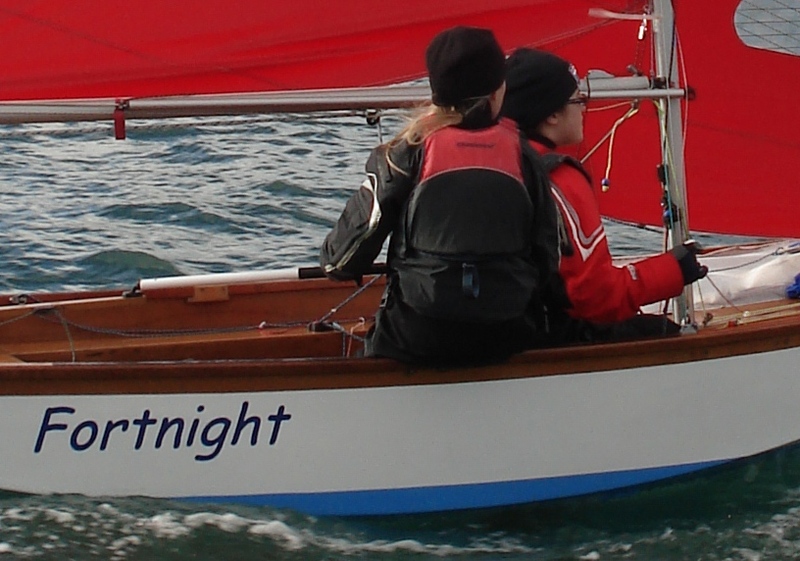 At the time of writing (2015), UK, Irish and South African boats tend to sheet onto the thwart, Australian boats tend to sheet onto the side deck. An Australian boat was 2nd at 2015 Worlds using this arrangement, so there is not a lot to choose between the two methods. However, it's a lot easier to bolt fittings onto the thwart than it is to attach them to the side deck. On a wooden boat there is, traditionally, one 20mm X 16mm batten underneath the middle of the side deck. This is not enough for both fairlead & cleat, and may not be ideally placed, so normally backing plates or blocks are fitted under the deck (i.e. 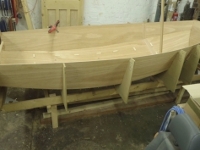 when the boat was built) or mounting blocks are glued above the deck to give something to screw the fittings onto. Note that Mirror Class Rules restrict the thickness of mounting blocks for the jib fairleads or cleats to no more than 25mm. 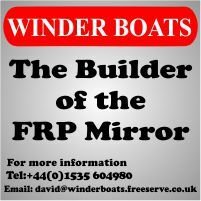 The UK Mirror Class Association are recommending 6mm line for jib sheets. The thickness of the jib sheets will, in turn, determine the size of the jib fairleads and cleats. 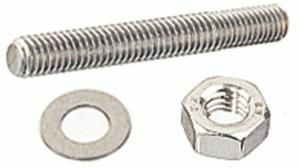 With 6mm sheets, I recommend either Allen Brothers A4152 bullseye fairlead with stainless steel insert (Internal Diameter = 13mm), or the A152 bullseye fairlead (Internal diameter = 14mm). It makes sense to mount these so they bisect the angle turned by the jib sheet as it passes through the fairlead and across the boat to the crew. In the photograph there is a gap of about 25mm between the fairlead & the cleat at the closest point. In this case the fairleads are set up as per the Malcolm Goodwin tuning sheet - on the thwart, as far aft and as far outboard as possible. A small cam cleat, like the Ronstan RF5001, is perfectly adequate on a Mirror. 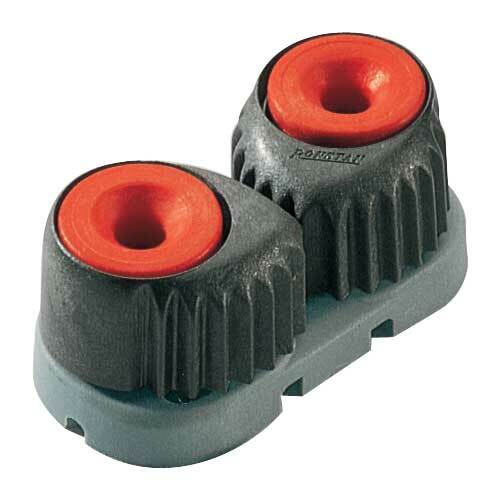 Mounting the fairleads and/or cleats on blocks or risers is a good idea, though there are different approaches. It makes it easier for the crew to apply some downward pressure to the sheet the help cleat it. On 70606 'All The Right Reasons' both fairleads and cleats are mounted on a block. On Winder 70618 'Tinytanic', both the fairleads and cleats are on risers. 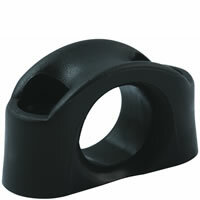 I prefer fairleads mounted directly onto the thwart & cleats on mounting blocks which slope fore & aft. 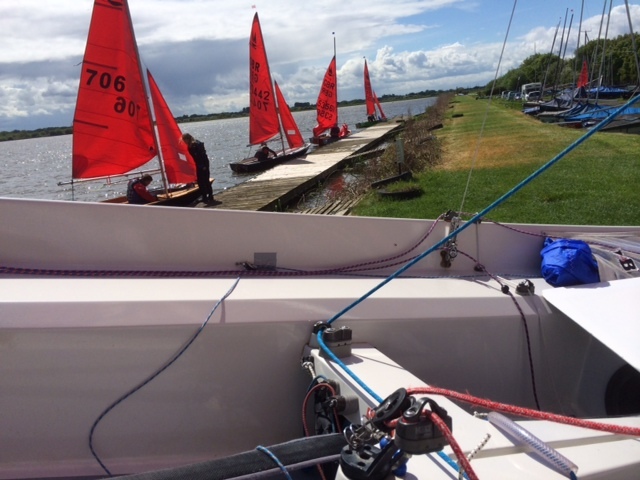 Having the cleat raised up makes it easier to cleat the jib when the crew is sitting on the gunwale. The slope means means if the crew is sitting aft (i.e. when planing), the jib sheet can be played, out of the cleat. 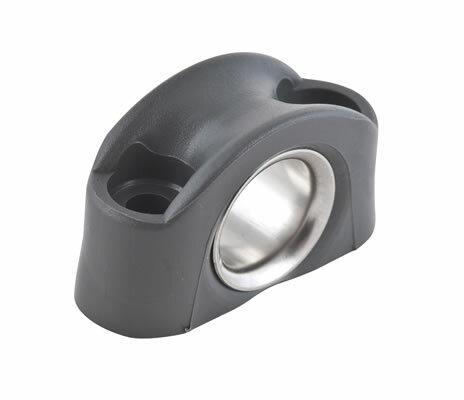 If the cleat has a thick base, you can mount the fairlead on a block of similar thickness. For a small cleat like the Ronstan RF5400, I would make the sloping surface of the mounting block 50mm long by 25mm wide and just under 25mm thick. As ever, fittings should be bolted on rather than screwed with self tapping screws. In this case I've used M4 stainless steel machine screws on the fairlead & M4 stainless steel studding (for example Holt F157) on the cleat (because I could not purchase an M4 machine screw that was long enough to go through the cleat, mounting block and thwart).